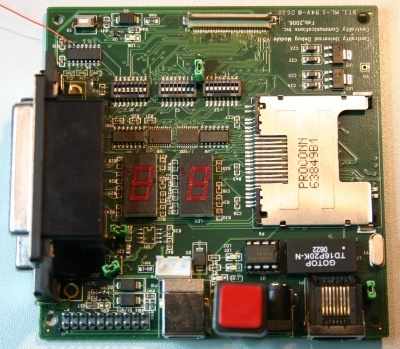 This debug board was used internally at Openmoko. Use the flat ribbon-cable to connect to the phone. Place the copper contacts on the bottom (brown surface facing to the top. The serial console is available via one of the two DB9-sockets, It has a DTE (terminal) configuration. The socket is called "P4", which is written in small white letters next to it on the PCB. If you're looking at the three female DB-Ports (from the plug side), it is the left port. You can use any standard USB-Serial converter and plug it directly onto the DB9-socket. There's no level-shifting required. NOTE: Please see Debug Board#Errata below! 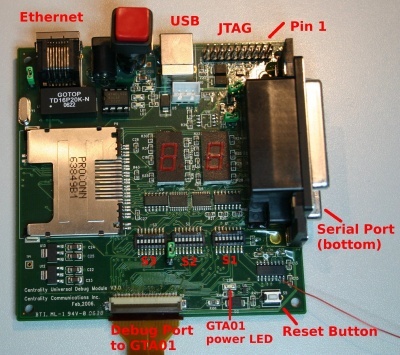 The 20pin JTAG header is a standard ARM JTAG. Pin 1 can be found next to the corner of the PCB (small white circular mark printed on PCB). If you need Ethernet, you will have to either supply power via the USB device jack, or via a +5V power supply. S5 (small white button in corner of PCB) is a reset button. If you press it, it resets the device. We never tried to make them work. There currently is no software/driver support for the Ethernet port in Openmoko. Nobody has successfully tried to make it work. 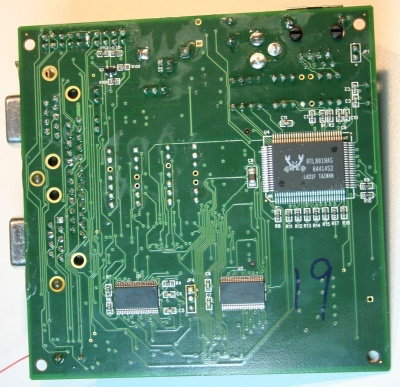 The debug board and GTA01Bv2 try to drive the same line (GSM_EN) which switches between serial console and GSM Modem. To resolve this conflict (and give ownership of that signal to GTA01), you need to unsolder both R105 and R106. Those resistors are located very close to the 2x10pin JTAG header. This page was last modified on 22 October 2008, at 14:16. This page has been accessed 48,257 times.